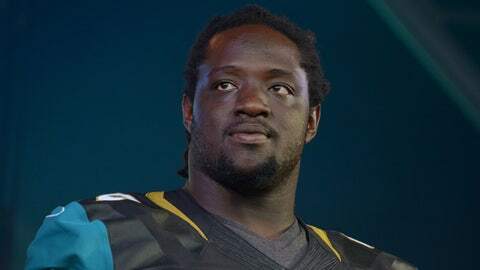 Sen'Derrick Marks had 28 tackles and four sacks for the Jaguars in 2013. JACKSONVILLE, Fla. (AP) — With over $20 million of cap space available for 2014, the Jacksonville Jaguars figure to be active in the free-agency market in the offseason. Friday, the team made sure one of their top defensive players didn’t join that market. The Jaguars signed defensive tackle Sen’Derrick Marks to a 4-year contract extension worth a reported $22 million. Marks had signed a one-year deal with the team last spring after spending his four seasons with the Tennessee Titans. He would have become a free agent Monday had he not signed an extension Friday. Jacksonville general manager Dave Caldwell said Marks and the Jaguars were a good fit and that there were reasons to get the deal done before the end of the season. "The player wanted to be here; two, we wanted him here; and three, we were able to do it before the season ended and put some of the money into this year’s salary cap," Caldwell said. Marks has been one of the few bright spots for a defense that has struggled this year. He has started all 15 games and has 28 tackles, seven pass breakups and four sacks. He has played in 84 percent of the team’s defensive plays this season. Marks said he was surprised that the deal was finalized before the end of the season. "It’s very cool. I didn’t expect it," he said. "I thought it was going to go all the way until the offseason, but I was never worried about what would happen. "My job is to go out and continue to play. We still have a game left, so I didn’t even think about it." Jaguars coach Gus Bradley said the signing of Marks was an indication of the direction the team is going. "It’s all about the direction we want to go to get key people like Sen’Derrick," Bradley said. "He’s done a great job; great job competing, great job leading with our younger guys in the meeting room every day. We knew Sen’Derrick really wanted to be here and to get it accomplished at this time is awesome."